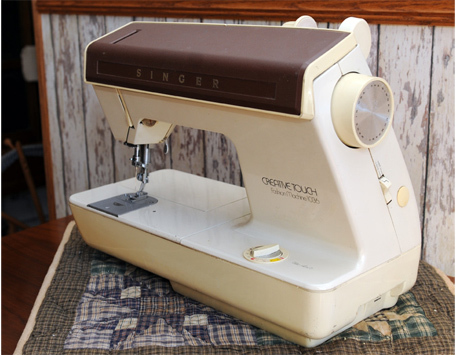 This Singer 1036, which we purchased during the Christmas season of 2010 in Asheville, North Carolina, is our first machine of this style and we are currently in process of learning about it. An unfortunate thing about it is that the take-up arm broke off as we were winding the bobbin for the first time. We suspect that the arm was damaged earlier and our putting a little strain on it was the final blow. The arm, since it protrudes through a slot in the top cover, is vulnerable to damage caused by storing items on top of the machine or by other mishandling. This a case of allowing form to follow function to the extreme. In our humble opinion, the really good thing about this design is that it brings the needle right up close and personal. Notice how close the needle plate is to the front of the machine. 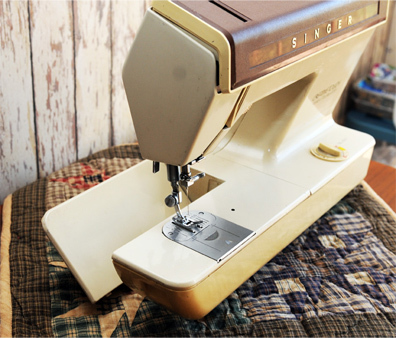 (In most sewing machines, the needle is nearly centered in the bed.) The 1036 needle position has its advantages if the seamstress has poor eyesight. However, positioning the needle in this location takes away a flat surface upon which fabrics that are about to be sewn can be aligned and guided into the needle. Controls for the machine are under the top cover. The left-hand round knobs permit adjustment of needle position (left and right) and stitch width. The right-hand knob can be used to select from several stitch patterns. Stitch length is adjusted by the round knob on the bed's right side. 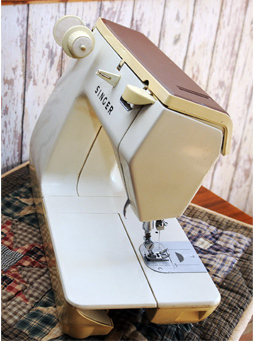 This 1036 is our first machine with this type of bobbin. The bobbin is wound in position. The advantage of this feature is that the needle doesn't have to be unthreaded to fill the bobbin. One certainly needs a manual to learn how to use this capability. We don't have a manual or accessories for our machine, but that is only a matter of time since there are a lot of things not obvious. Serial number of our machine is E01232018. This image shows the free arm feature of the Singer 1036. The rear of the bed drops down permitting ease of sewing such things as shirt sleeves or pant cuffs. 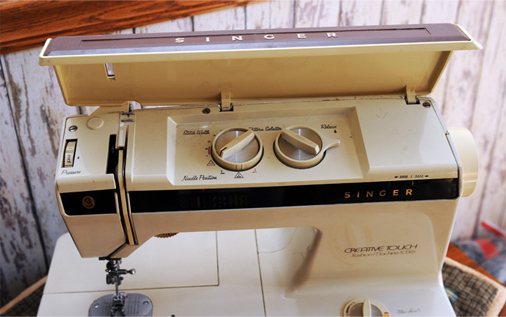 Our Singer 1036 is a slant-needle configuration. 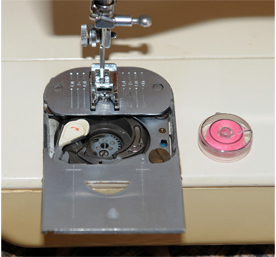 This feature allows the needle to be positioned much closer to the seamstress.